Yes, outdoor lights perform the critical task of illuminating the outdoor space, making it less susceptible to intrusions. But then, outdoor lighting has a very serious artistic aspect too. We are the outdoor lighting specialists. We help your outdoors space to exude dynamism. Move away from oh-so-dull outdoor lights and enter our world of beautiful outdoor hanging lights. Ceiling outdoor hanging lights uniformly drench the area with a soft, warm glow, making the space seem more welcoming. These lights can be judiciously hung on your porch, walkway or garden. Often used as walkway lights these are designed to offer uniform illumination and vivacity. 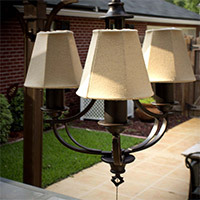 These easy to install outdoor hanging lights come with impressive versatility. Often these are hung to create a not-so-defined spotlight over blooming flowers. Outdoor Hanging Lights There are 315 products.